I’m not actually sure how I ended up receiving a copy of this book, but since I do have an eight-year-old niece, I figured she might find it quite enjoyable. So we read it together today. 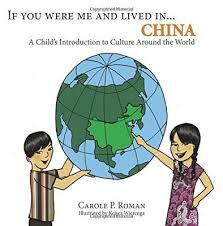 I thought this book was a good way of introducing a child to China. It was good to see that there were pronunciations of some of the words… my niece had great fun sounding some of them out! I think there could have been a bit more explanation as to why some of the spellings were vastly different to the way the words were pronounced. My niece was a bit confused by that fact. It was interesting to read about the origin of the country’s name and I liked the fact that the narrative addressed the reader directly. I think there could have been a couple more guessing games included… but my niece did engage with the couple of, ‘What does this word mean?’ questions. There were quite a few interesting facts in this book, such as the different foods people from different parts of China might eat and the estimated length of the Great Wall of China. There were some really good illustrations in this book… and a couple of really nice photos, too. There was a good one of the Wall which had illustrations of children walking on it. Although there were a few typos, such as missing words and wrong words, I thought this book worked really well as an informational one. It was a nice length and it was easy to read to my niece. My niece also told me she thought it was really great. She said she liked being able to learn some of the language and she tried out ‘I love you’ on her mum and Granddad, as well as others in the family. I’ve given her the book to keep and I expect she might be interested in learning more of the Chinese culture in the future. (She liked the name Zi when we looked at the page about the names you might have if you were born in China). I’m sure I’d get her other books by this author in the future. And when my nephew’s a bit older, he might enjoy learning about China as well.